And by affordable, this little lacy number is only £30. 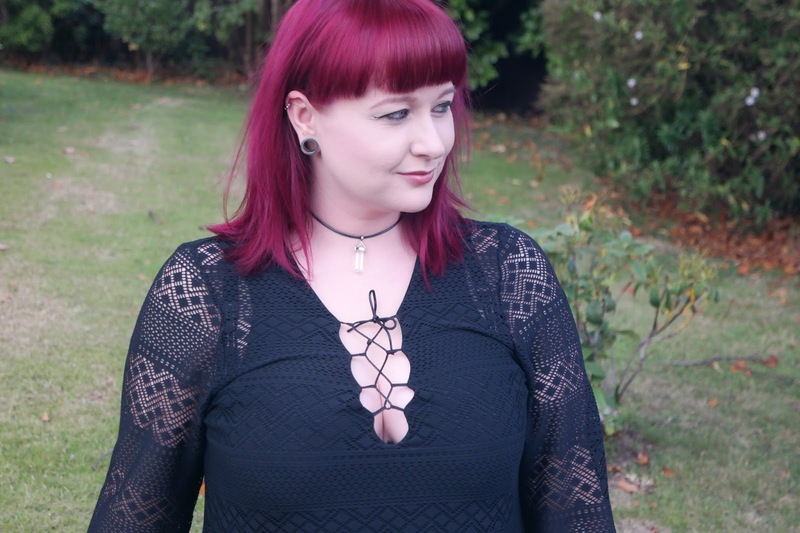 I'd never normally consider myself fashionable, I mean, I normally wear supermarket jeans and New Rock boots that I bought in 2006 but this little beauty made me feel bang on trend right now with the front tie and lace sleeves while still keeping my witchy vibes alive. Pink Clove are a plus-sized online retailer that cater for sizes 16-28, they offer worldwide delivery, free returns and 20% off too if you're lucky enough to still be a student. Their items are super affordable - for instance the most expensive dress on their site right now is £33 so if you're thinking of looking for some purse-friendly togs anytime soon, hit them up. Their range of dresses are super cute and they'd be perfect for the Christmas party season too if you're already in that mindset....I totally am! I flirt between a dress size 16-18 and opted for this one in a size 18. The nature of the floaty fabric however lends itself to be very forgiving and I'd say this dress is really quite generous fitting. Next on my wishlist has to be this gorgeous red plunge neckline wrap dress - at £22 I don't know if I'm going to be able to say no. Have you ever shopped with Pink Clove? Fancy a little treat for your next order? Just enter PINKCLOVE10 for 10% off. *My dress has just gone out of stock online but in the meantime if you fancy something similar, there is the longer version available here. It's been so handy too, I've gotten so much wear out of it!